Range: Northwestern United States, Canada, Alaska, Midwestern United States, and Florida. 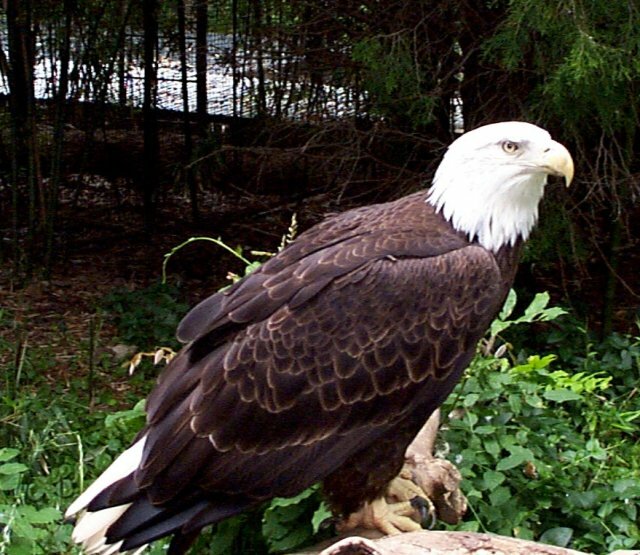 Habitat: Bald Eagles are found near open water and tall trees. Status: Bald Eagles are listed as a threatened species. They were listed as an endangered species until 1995. Diet in the Wild: Fish, Birds, and sometimes will scavenge for food. Diet in the Zoo: Rats, chicks, capelin, and a large bone with meat on it. Physical Description: The Bald Eagle has a wing span of 6.5-8 feet. The body of the eagle is usually 31- 37 inches weighing between 9 and 18 pounds. At birth, the feathers of a Bald Eagle are light gray. As the offspring grow, they develop feathers that are dark brown when they are about 12 weeks old. Finally, during the eagle's third and fourth year they begin to develop the distinctive white feathers that are on the head and tail. General Information: The Bald Eagle is the only eagle species that is found exclusively in North America. They are often found in many of the northwestern states of the U.S. and Canada. The founding fathers, of the United States, made the Bald Eagle the United States' national symbol in 1782. Bald Eagles migrate south during the winter following fowl and other forms of food. Bald eagles rely on fish to find food so you will often find them near lakes, rivers, or streams. Eagles make their nests in the tops of tall trees or on the side of a cliff. Feeding Habits: Bald Eagles often feed on fish which they will catch themselves, find dead, or pirate from other birds such as the Osprey. They will also feed on a variety of carrion, or live prey including water fowl, rabbits, turtles, and snakes. Eagles dive down to capture their prey and then carry it off in flight. However, they can only carry about half of their own body weight. Special Adaptations: Bald Eagles use wind currents to stay aloft and soar for hours at a time. Their massive wing span allows the warm currents to keep the eagle in the air. 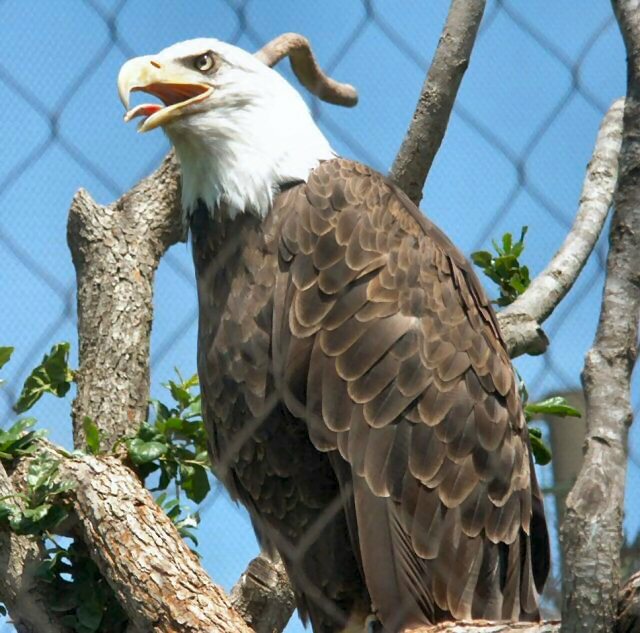 The eyes, of the Bald Eagle, are very powerful allowing the eagle to see small animals while flying high in the sky. The talons of the birds are very powerful allowing the eagle to catch its prey and carry it off to eat. Comments: I believe that captivity has made a high impact on the Bald Eagle. Having eagles close, where they can be studied, has helped us understand the stress that is put upon them with the loss of their natural habitat. However, the eagles migration habits cannot be studied in captivity. 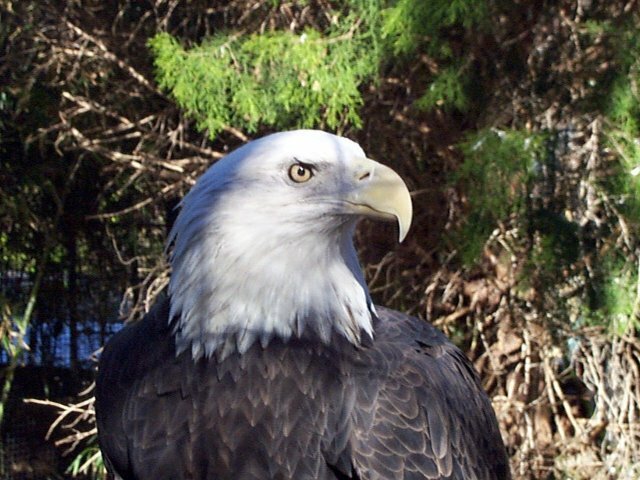 Current Research: The Bald Eagle is off of the endangered species list, but the population of the species is still a great concern. Studies have shown that there has been a steady increase in the Bald Eagle population over the last few years. Researchers are also trying to find new ways to preserve the Bald Eagles natural habitat by studying the nesting and feeding habits of the eagles.